In this brave new world of downloadable console games, it is easy for an old curmudgeon like Yours Truly to worry about the fate of traditional platformers. Can good 'ol fashioned 2D sidescrollers exist in a world whose newest medium brings us everything from artistic experimentation to the patently absurd? Fortunately, Lost Winds, created by Fronteir Developments and released on WiiWare, assuages any fears related to platformers' fates in this climate of blooming DLC. More importantly, it embraces the latest format and technology to enhance the old 2D formula to provide a fresh take on gameplay with deep roots. 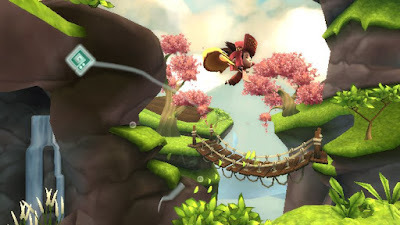 Lost Winds makes excellent use of the Wii's unique control style in terms of both story and gameplay. The plot itself is one that sounds familiar enough: a young boy, Toku, happens upon a benevolent wind-spirit, Enril, and the two join forces in order to prevent an evil deity from grabbing power. Things get a bit more complicated in the execution of this mission: using the Nunchuk to control Toku and the Wiimote to control Enril, the player traverses landscapes, solves puzzles, and fights baddies in hopes of saving the fair land of Mystralis. In Lost Winds, the player advances the plot by utilizing the Toku and Enril's divided skill sets. Because of this, both the gameplay and the story contain novel takes on traditional video game mainstays. Unlike so many other platform heroes, Toku lacks the power to jump twice his height, and he is unable to conjure fireballs, or wield a mace to thwart opponents. Running, gathering items, and short hops are the order of the day. Super-human feats are supplied by Enril and controlled by a variety of subtle, yet distinct Wiimote motions. Fast, straight lines elicit gusts used to help Toku jump over chasms. More complex aerial routes are achieved by tracing flight paths for Toku to glide on with his Super Mario World-inspired cape. Although the infamous "Wii waggle" is present, it is used strategically to create a small cyclone that cushions the fall from a high ledge. Enril and Toku work in unison when solving puzzles that require the use of environmental objects like torches and boulders. Whether it is trouncing baddies or scaling the village rooftops, the game teaches the player to use both characters, and both control inputs in unison. This complementary dynamic is elegantly linked with the game's narrative. Toku and Enril rely on one another within the narrative to complete their quest, and the player must learn to integrate their divided skill sets during the gameplay. Initially, not having a "jump" button was disconcerting in both a narrative and gameplay sense: thoughts of "I wish I had a jump button!" were followed by "Why can't this guy jump?" Thankfully, the omission morphed from an annoyance to a pleasure: it forced me to experiment with the wind, thereby letting me discover the nuance in the controls while also inspiring deeper thought about the game's characters. Even when not performing an attack or aerial technique, subtle touches remind the player that he exists as a companion as well as a reticule. Every time a character addresses Enril, it differentiates his function from the legions of other Wii games with WiiMote cursors. Enril's movement continuously impacts the environment: if the player moves the cursor past a character, a gentle breeze ruffles their clothes, leaves rustle asEnril glides past them, and health items are yielded by whisking through the grass. All this is presented graphically in a modest, yet pleasant storybook motif. Pastel hues and backgrounds resembling water-color paintings are favored over highly detailed textures and realism. Rather than animated cut scenes, stylized tableaux paintings are used for expository purposes. The artwork in these scenes is a cross between concept art and mock-archaeological glyphs that give the world of Mystralis a textured feel. These visuals supply much needed breaks in between some challenging gameplay segments. Lost Winds, despite the impish look of its characters and its existence on a "casual gamer" console, is no pushover in terms of challenge. Controlling the wind to manipulate objects takes patience and precise movements and the puzzles require surprising amounts of physical and mental dexterity to perform. Many times I had to reach solid ground and stop for a moment to size up my surroundings in hopes of finding a solution to a puzzle, or to prepare for a particularly difficult series of wind-assisted jumps. As many of you know by now, I am somewhat of a masochist when it comes to video games. These difficulties did not bother me, but I can easily see how some might be turned some of the game's more unforgiving elements. In many ways, the game is perfect for someone that likes their games to push back: optional collectibles add depth to the action and the puzzles, the lack of a map means those that learn the world will have an easier time finding their goals, and the various wind-related gymnastics and attacks take time to master. 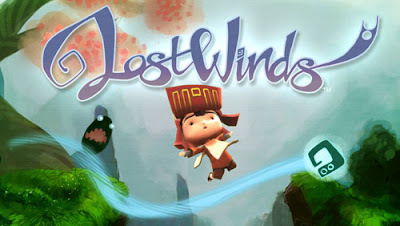 Lost Winds takes advantage of the possibilities the Wii presents and marries them to long-held gaming concepts to create something charmingly innovative. The game's delicate gameplay and narrative touches impress without drawing attention away from the experience as a whole. Like many downloadable games, Lost Winds can be completed in a relatively short amount of time. A sequel has been confirmed, and I will be interested to see what direction the series goes. I could see the game becoming episodic, with each installment focusing on a different gameplay style; perhaps one segment would be a series of Braid-like puzzles while another a gauntlet of Shadow of the Colossus-inspired boss battles? Lost Winds strikes a perfect balance for someone who can be circumspect in their gaming tastes. Although these are the winds of change, they carry with them an air of familiarity. There is more 2d goodness to come! Wiiware will also be getting the Vanillaware's followup to the brilliant Odin Sphere-- Muramasa: The Demon Blade. There is also a Wiiware remake of A Boy and His Blob, which is another game where you have to rely on the help of your companion. You've also got the intentionally retro Mega Man 9 for Wii as well. Sweet list JT! So many delicious two-dimensional treats. While not a platformer, I've recently been playing Bit.Trip Beat. Have you played it? It's definitely got the old school ethos down. The game seems to delight in punishing you!